Thank you for organising the 2015 Sydney Dog Lovers Show. Our Club had a great time and look forward to coming back in 2016. Please pass on your thanks to Russell, Ella and Alysha and the rest of the team - they did a fantastic job. I am going to circulate your message to my helpers and ask if they have any comments on the show and on how it could be improved in 2016. At our club meetings we often talk about how we can involve our pet owners, i.e. those who do not show their dogs. I now know that the Sydney Dog Lovers Show is the perfect venue for us to showcase our dogs and for our loving owners to promote our wonderful dogs. 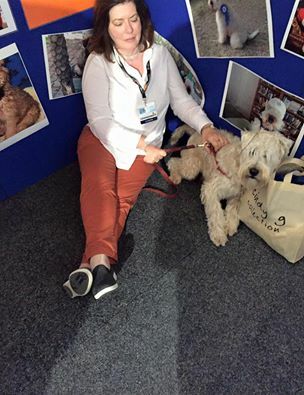 Our owners did a superb job and our dogs rose to the occasion, and the public were smothered with wheaten kisses. I recall your official photographer taking quite a few photos of the Soft Coated Wheaten Terrier Stand. I didn't expect them to be in the photo gallery, but I wonder if there are any photos, if they could be sent to me so that I can use them to publicise our intention to participate in 2016. My husband Graham and came along for the event and wasn't expecting to be involved. However, things turned out differently and he had a wonderful time. Graham was an interpreter/translator with the United Nations in Geneva for many years and is totally fluent in a number of languages. We had enquiries from a lady from Russia whose English was limited, so Graham took over and again with French, Spanish and German speakers. So it was wonderful that we were able to help. I printed out 200 flyers on our breed and returned home with 7 - a fantastic effort and by Monday morning one of our breeders in Melbourne had already received a call from a lady looking for a puppy. With my very best wishes on behalf of all the SCWTs and our helpers.